It is well known to everyone these days, that the Samsung made Super AMOLED screens are the standard to beat in the mobile industry. LG surely thinks so. 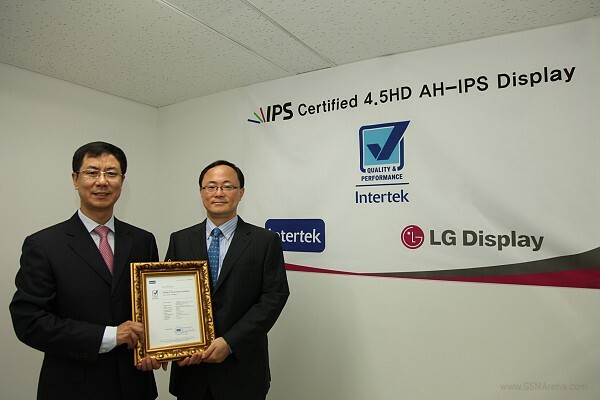 The Korean company’s yet to be launched AH-IPS display for mobile devices, just received the prestigious Quality & Performance Mark from Intertek – a global testing and certification company. What’s particularly important about this award for LG, is that it has been achieved by comparing its display with no other but Samsung Galaxy SII’s Super AMOLED screen. Now on with some numbers. The award winning AH-IPS display from LG measures 4.5″ and has HD(720×1280 pixels) resolution with 329ppi. Samsung Galaxu SII’s Super AMOLED unit on the other hand, measures 4.3″ and settles for WVGA (480×800 pixels) resolution and 217ppi. All in all, the LG unit trumped the Samsung made screen in color accuracy and power consumption by a significant margin. In the color accuracy test, the LG display scored a rating of 0.012, compared with 0.037 for the Super AMOLED from Samsung. Here, it is important to note that the lower the color accuracy value is, the smaller the gap between original and reproduced color. In the power consumption test, the AH-IPS screen was found to consume a constant level of power, measured at 624mW, compared to 1130mW of the Super AMOLED, while boasting 600 nits of brightness. In plain words, the LG screen is significantly more power efficient than its competitor. While this is all great news for LG, I can’t help but wonder if this can be considered a victory for the company against Samsung in the battle of mobile screens. LG’s AH-IPS screen is yet to be seen in a mobile device, while Samsung’s Super AMOLED screen has been out on the market for well over six months. Samsung is also about to release its own AMOLED screen with HD resolution in the nearest future and, I dare to think, it will be more appropriate for it to be compared with the excellent LG unit. The results might just end up being a bit different then, don’t you think?